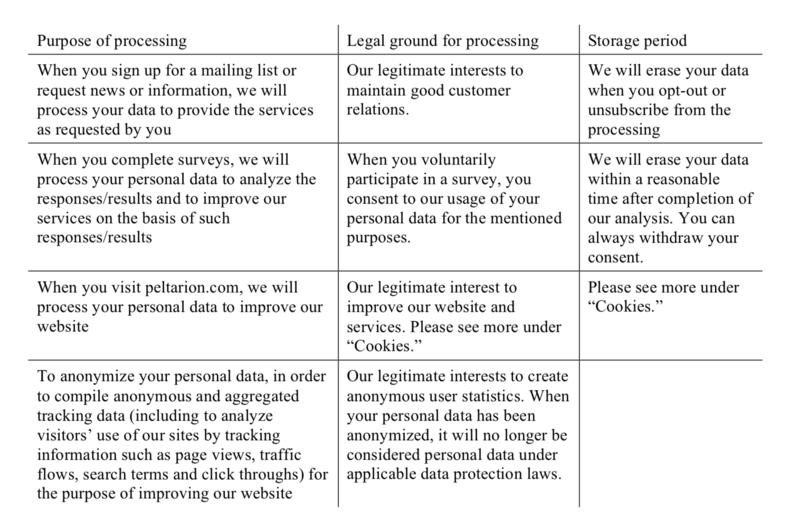 We will only use your personal data for the purposes, and on the basis of the legal grounds, as set out below. We will not use your personal data for any purpose that is incompatible with the below purposes. Further, we will only use your personal data during the period as set out in the right column, after such period your data will be erased. To achieve the purposes, we may share your personal data with our subcontractors. Such subcontractors provide storage services, advertising services and services for troubleshooting and correction of any defects in our website. Some of our subcontractors may process your personal data outside the European Economic Area (EEA). However, a transfer will only occur, if there is a legal ground for the transfer, e.g. by (i) executing EU standard data protection clauses with the recipient of the personal data, or (ii) ensuring that the country has an adequate level of protection of personal data, as decided by the EU Commission, or (iii) for transfers to and processing in the USA, ensuring that the recipient holds self-certifying registrations under the EU-U.S. and the Swiss-U.S. Privacy Shield Frameworks administered by the U.S. Department of Commerce’s International Trade Administration. We use two types of cookies: persistent cookies and session cookies. A persistent cookie helps us recognize you as an existing user, so it's easier to return to our website or interact with our services without signing in again. After you sign in, a persistent cookie stays in your browser and will be read by us when you return to our site. Session cookies only last for as long as the session (usually the current visit to a website or a browser session).